After a series of thrillers and crime stories this was a refreshing break. All thanks to Blogadda again. Sometimes you get in this mood for a light read and I was exactly in this mood when I got this book. Sneha the single mom is enjoying the new phase in her life, with her little son Advey, after her divorce. Nandini, Sneha’s BFF tries hard to fix blind dates for her but in vain. Poor Sneha is almost forced to meet an ‘eligible‘ suitor at every party that Nandini throws. The two friends have been together through thick and thin and are protective about each other. Sneha comes across Nikhil with whom she shared an unpleasant past and comes to know about Gayatri – ex flame of Adiyta, Nanidi’s husband. Time brings a tough situation for Sneha and she needs to keep aside ego, history and opinions to save her best friends. 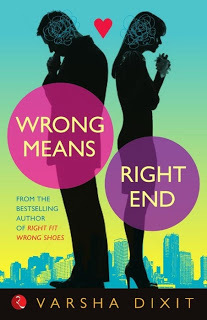 Wrong Means Right End is all about relationships and emotions. Very heart-warming at some moments to see such close friendship and bonds. Though a light read you find twists and turns throughout the story. However, it sometimes gets predictable. It’s like you are reading about matured relationship ala M&B Moderns, where you have filthy rich lovers ( husband in this case) showering love OTT. Sneha is a free-spirited woman and her character is well sketched. I would have been disappointed if she was made a stereotyped divorcee woman. She is smart, independent woman taking up responsibilities for her son as well as taking care of her friend when she needs the most. Certain things that didn’t go down to well with me are the cuss words – why would I refer my best friend as ‘Kulta’. For God’s sake no – my BFF will kill me for that. Anyway, the deliberate mispronounced cuss words also doesn’t help much – at least for me. Bust the two high points in the book are the strong and deep bond between the friends and the raw chemistry between Sneha and Nikhil. It’s those kind of quick of reads which you like when you are spending hours between a flights at the airport or are travelling long hours. There’s a feel good factor. nice post.. thanx dear.. i was indeed looking for a light read..